20th September 1916. 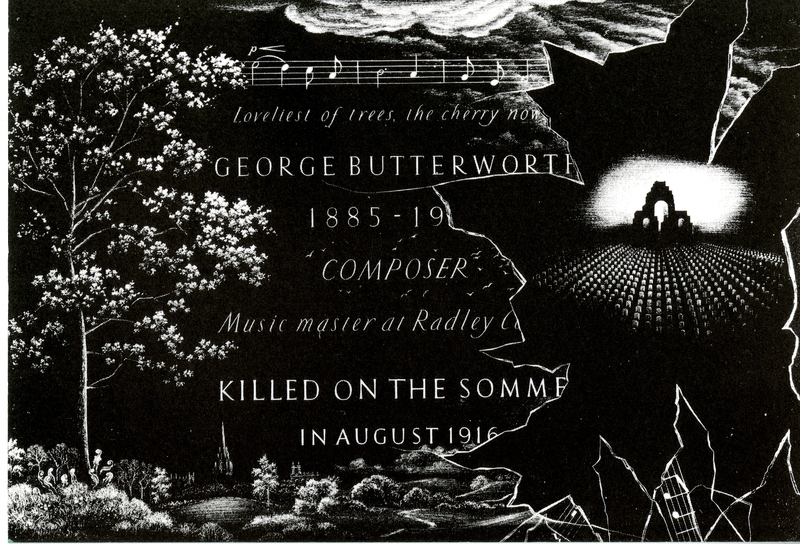 George Butterworth, MC. Don & Composer. Lt, 13th Bn, Durham Light Infantry. Killed in action at Pozieres. As a Don at Radley, he inspired a love of English pastoral music, reflected in the Music Society Minutes after he left. With Lance Vidal (kia 25 September 1915) he encouraged the boys to take up Morris dancing. He composed part of the Shropshire Lad Suite whilst at Radley. DEAR SIR ALEXANDER, I feel I must write you a note to tell you how deeply I grieve with you and yours for the loss of your gallant son. He was one of those quiet, unassuming men whose path did not appear naturally to be a military one, and I had watched him doing his duty quietly and conscientiously. … Later we went into a line on the right of the Australians, S.E. of Pozieres. Here we were about 450 yards from the Germans, and I gave orders to dig a trench within 200 yards of them so that we could attack with some chance of success. This trench was dug in a fog, and was a very fine deep trench which saved many lives in the days to follow, and your son again superintended the work, and it was called Butterworth trench on all the official maps. Posted in Commemorating the Fallen of WW1 and tagged 1st Battle of the Somme, killed in action, Lieutenant, Military Cross, Musician, Schoolmaster on 20 September, 2016 by archives602.